The Super Bowl is supposed to feature the two top teams in the NFL playing for a championship, but rarely do the best teams throughout the regular season end up being the teams playing for the Lombardi Trophy. The Seattle Seahawks and Denver Broncos were the best team in each conference for the entirety of the season and will be facing each other at MetLife Stadium in Super Bowl XLVIII. Thanks to this matchup, Super Bowl tickets are the most expensive they’ve been for the past five Super Bowls. Currently the average price for a ticket on the secondary market is $4,063.62, with a low price of $2,110. The average price was in line with the past few Super Bowls with a $3,448.79 average on January 6, but has seen and 18.89% increase since then. Last year’s Super Bowl between the San Francisco 49ers and Baltimore Ravens in New Orleans had an average price of just $3,083. This price would be just above the average secondary price of Super Bowl XLV between the Pittsburgh Steelers and Green Bay Packers at Cowboys Stadium in Arlington, Texas in the first season of that stadium’s existence. MetLife Stadium has been around for a few years, but this is the first major NFL event, aside from regular season Giants and Jets games, in this stadium. Because of the open stadium in a cold weather area, there is still some intrigue as to how the weather in February could affect the game. There has been talk of the weather since the stadium was first given the opportunity to host the Super Bowl, but ticket priced and demand show no weather will be keeping away from attending the game. While the average price is above $4,000, the average price of a sold ticket so far is $3,632.15, just slightly below the average listed price and much higher than the get-in price. This year’s low price is above the average secondary market price of Super Bowl XLIII five years ago between the Steelers and Arizona Cardinals. The $2,110 get-in price would put fans in the corner of the upper end zone in section 348. To get into the Mezzanine level, the lowest price if $2,929 for section 226 and the lowest price for a Lower Level seat is $2,980 in section 149. For those not looking for the cheapest seat in the house, the most expensive single seat for the game is in the Lower Club section 113 for $29,900. If the cold weather does scare you a bit, suites are available for you and 29 of your closest friends ranging from $575,000 to $1,019,000. There is some home field advantage for fan in New York and New Jersey as they lead the areas the have been searching for Super Bowl tickets the most. The owners of the best home field advantage in the NFL are trying to keep that in the Super Bowl, though, as fans from the state of Washington are the third highest group searching for Super Bowl tickets, despite Seattle being just under 3,000 miles away from East Rutherford, New Jersey. 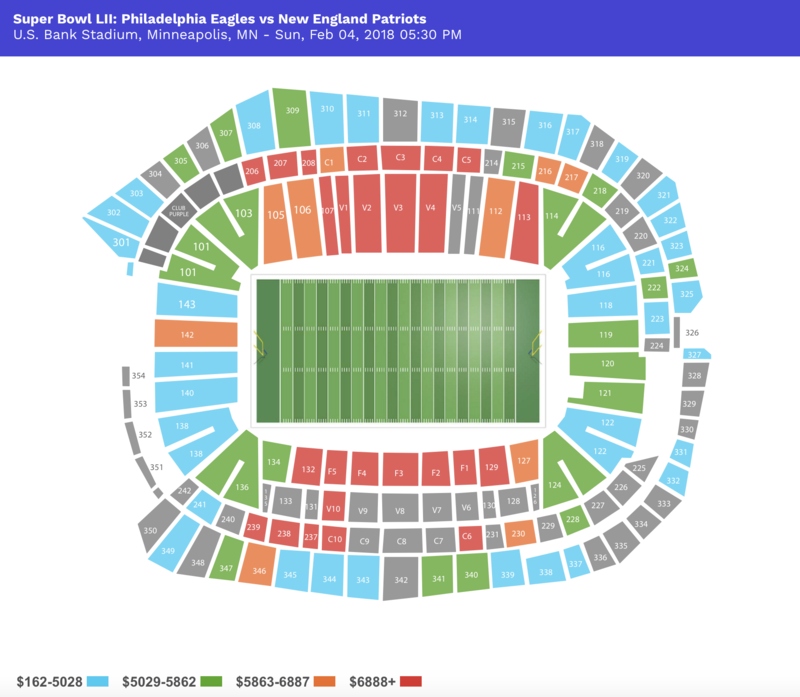 With two weeks to go until the game, there’s plenty of time for the price to fluctuate, but at the moment these tickets are at a premium compared to the past five Super Bowls. When the game is in the New York area and features the actual two best teams, one of them with Peyton Manning, high ticket prices shouldn’t be much of a surprise. For more on Super Bowl tickets, check out these two articles from Forbes.